Great News! 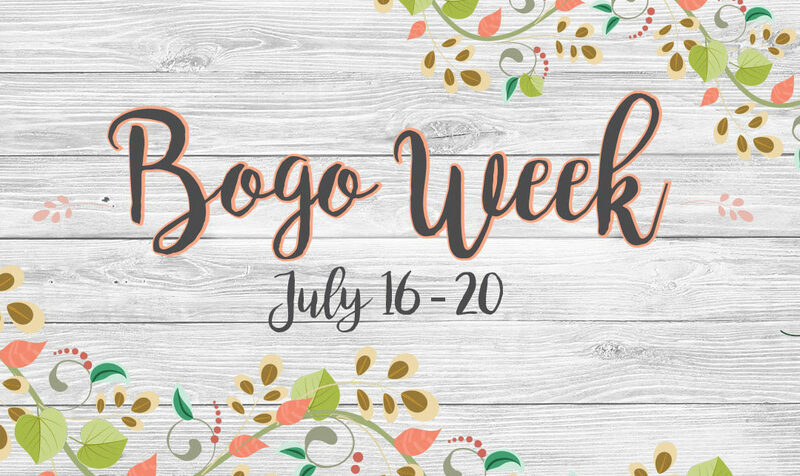 This week is Bogo (Buy One Get One) Week. Every day doTERRA will be releasing a new offer. If you already have a doTERRA account make sure to place your order DAILY. Offers are good for 24 hours ONLY. They also have a limited quantity. Once they run out, the Bogo is finished. There are no backorders. Don’t forget: Place your order as an LRP order and you will also receive PV points. You will receive your shipping back in PV points and your PV rewards. What a great deal! Get together with friends and place an order together. If you are not a doTERRA member you can also take advantage of the BOGO’s. You can reach out to me, and I can assist you to make sure you get your products at the best price possible. BUY doTERRA Serenity® (15mL) and get Lavender (15mL) for FREE!! Just say nighty, night! Both of these oils are great for relaxation and sleep. Lavender is also great for skin irritation and a host of other things. A drop or two on your dryer balls, and your laundry smells GREAT! 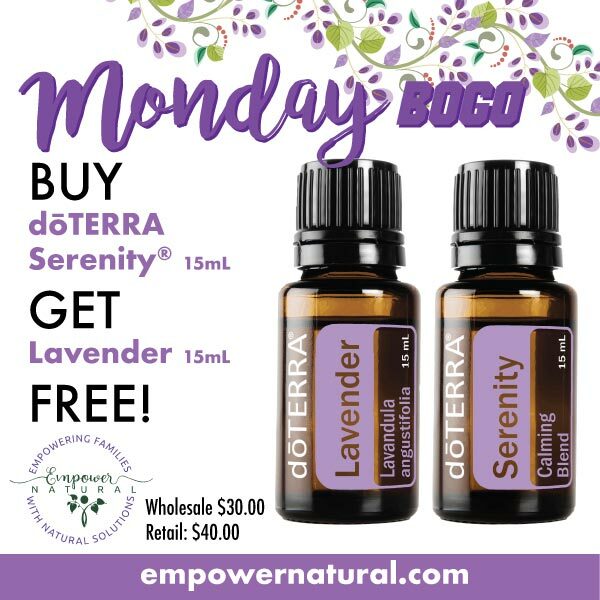 Purchase this BOGO duo through your own dōTERRA account until 11pm PST Monday by adding Serenity to your cart (Lavender will automatically add on checkout screen). HOLY COW! It’s a twofer! 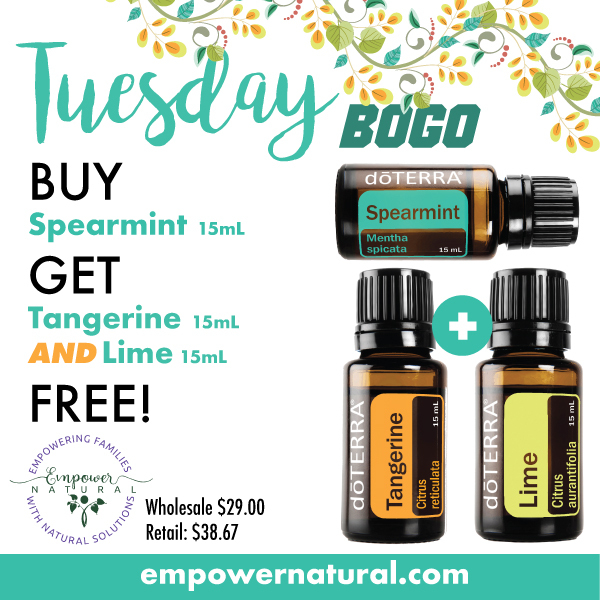 BUY doTERRA Spearmint (15mL) and get Tangerine (15mL) AND Lime (15 mL) for FREE!! Add a drop or two to your favorite desert, drink, or salad for flavoring and to promote digestion. It supports gastrointestinal function and health; relieves occasional heartburn and indigestion. Can this week get any better?? 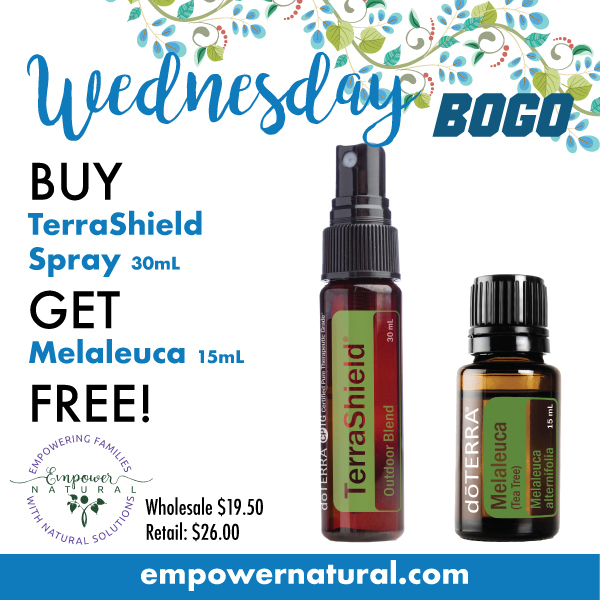 BUY doTERRA TerraShield Spray (30 mL) and Melaleuca (15 mL) for FREE!! Protect yourself against bugs naturally and get skin support this summer! No deet or harmful chemicals, and safe for the whole family including fur babies! Purchase this BOGO through your own dōTERRA account until 11pm PST Wednesday by adding Terrashield to your cart (Melaleuca will automatically add on checkout screen). 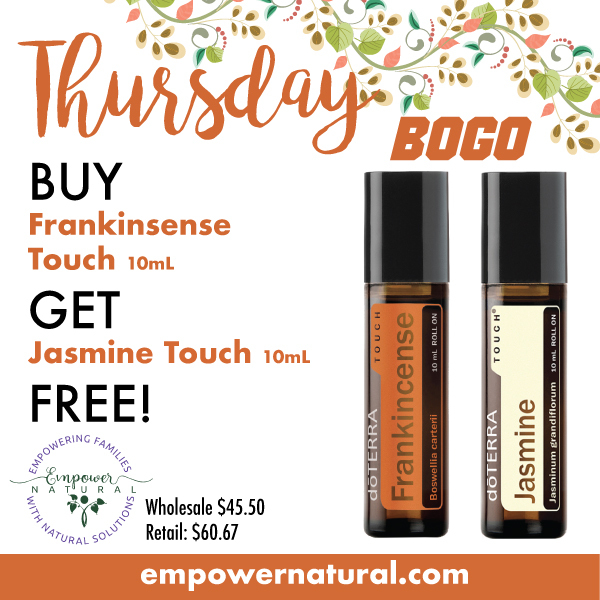 BUY doTERRA Frankincense Touch (10 mL) and get Jasmine Touch (10 mL) for FREE!! This duo is all about the skin. Reduce imperfections, have a beautiful glow, and feel relaxed and uplifted! Purchase this BOGO through your own dōTERRA account until 11pm PST Thursday by adding Frankincense Touch to your cart (Jasmine Touch will automatically add on checkout screen).